My cute friend Carissa, was having her first baby a few years ago and I wanted to make her an expecting mother necklace, but I didn’t want it to be too cutesie or to be something that is only relevant while pregnant. I wanted her to wear it even after the baby was born. 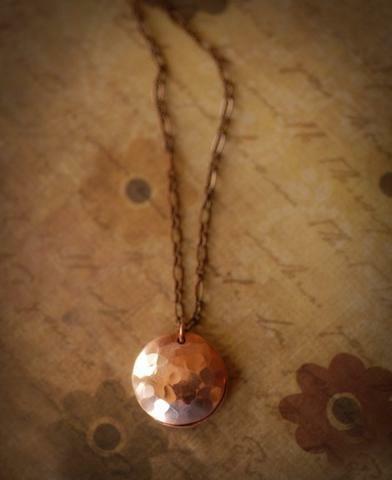 I came up with an earthy, copper necklace that is a bit like a pea in the pod, or a bun in the oven. I hammered two copper discs to give texture and then domed them to form a little clamshell. Nestled inside is the birthstone crystal of the month the baby was due. It’s a longer length necklace, which I love. The best part is, she can still wear it even though her baby is a toddler now. Find a penny, pick it up… This next one is a bracelet I made for my friend as a Christmas gift. I found pennies from the year she was born, the year she was married and the years that her children were born. I created this bracelet for her as a way to count her blessings, or all the ways in which she is lucky. I hand stamped the word “Lucky” on her birthday penny. It’s a cute, casual bracelet that I loved so much I made one for myself. I love it when I get requests for custom orders. It’s a creative challenge and I usually end up with a great new item to put in my Etsy shop!